While the rails are not constructed from aluminum, the composite material still provides a well balanced and lightweight design. While crossbows manufactured from Excalibur are known for performance and durability, the higher than average price often puts them out of the range of most consumers’ budgets. If you have been eyeing the other crossbows created by Excalibur but simply can’t afford the high cost, you might want to take a look at the Matrix Grizzly. It features all of the performance and strength you would expect from an Excalibur crossbow, but it comes at a price that will fit most budgets. With the Matrix Grizzly you don’t have to spend a fortune to get a high quality, top performing crossbow. How a crossbow is built will determine how smoothly and efficiently it performs, and is one of the most important aspects to consider. You want the frame and limbs to be sturdy and able to support the draw weight, without being too heavy to comfortably use. The build will also affect accuracy, which is always important whether you are target shooting or hunting game. The Matrix Grizzly is built to withstand the rigors of hunting, but it is also lightweight enough to comfortably carry to your favorite hunting spot. Weighing only 5.5 pounds, this crossbow is perfect for teens and adults. The sturdy frame is constructed from SMF composite materials that provide plenty of strength for powerful and accurate draws. The limbs feature a narrow 30 inch design that provides a smooth and straight path for your arrows, and the CRT build is strong enough to support the 200 pound draw weight. attractive and functional design. 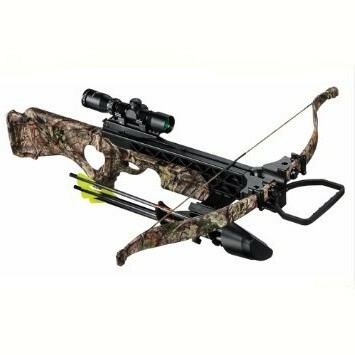 The affordable Matrix Grizzly from Excalibur comes with a “mossy oak” pattern on the frame that gives the crossbow a professional appearance, while also making it easy to blend into your surroundings. The crossbow features a compact design that measures 33 inches in length, which makes it ideal for use in cramped hunting blinds. The shorter stock fits comfortable against most hunters’ shoulders, and you will appreciate the convenient “thumbhole” design that gives you a safe and convenient place to steady your hands. Featuring an innovative design that is lightweight and easy to use, this affordable crossbow lives up to most expectations. How a crossbow performs will usually determine its price, but this is not true for the Matrix Grizzly. It is designed to provide you with the same high quality performance as other Excalibur crossbow, at a price that will fit most budgets. The SMF composite frame is sturdy and well balanced, and the limb set provides a smooth and narrow path for the arrow to follow on release. This will help make every shot count and hit the target exactly where you aimed. This crossbow is capable of a velocity up to 305 feet per second, and with a maximum draw weight of 200 pounds you can easily take down large and small game. The bow is accurate and reliable, and you will also appreciate how easy it is to load and fire. This crossbow package includes everything you need to start hunting, including an easy to read instruction manual. The simple directions will walk you through the step up steps so you can immediately start practicing with the bow. The vari-zone scope is easy to adjust, and will give you accurate readings so you can aim and plan your next shot. The rope cocking mechanism makes it extremely easy to load and set your arrows, and features an 11.5 inch power stroke. The relatively short power stroke may take some experienced archers a while to get used to, but it is the perfect feature to include for younger shooters who might not have the same strength as an adult. The crossbow package also includes 1 inch rings and a convenient quiver so you always know where your arrows are. With four diablo arrows and 4 150 grain field points also included, you can immediately start aiming at box targets or head out to see how the bow performs on a hunting trip. While most hunters and target shooters have probably looked at or handled an Excalibur crossbow the high price has made it difficult for most archers to afford one of these top rated models. To help everyone experience the smooth, fast and powerful performance of an Excalibur crossbow, the company has designed the affordable Matrix Grizzly.